The Army has been undergoing an iterative process to update its doctrine and operating concept as it adapts to a 21st world and the need to more seamlessly employ effects across the five domains of warfare. Now, after a little over a year of shifts, the Army is making a slight semantic change to its emerging concept to better encapsulate the activities that occur before, during and after conflict, as well as to assuage partner services, agencies and nations for greater buy-in. In the move to multi-domain operations, what gets lost? As the services debate the future of so-called multi-domain operations, some fear current service-specifics could be at risk in favor of a more joint concept. Citing a multitude of reasons for the slight name change, Townsend, the commanding general of Training and Doctrine Command, said ultimately “operations” is more all-encompassing. “Battles are often a necessary part of war, battles win fights, battles take ground, but battles in and of themselves do not win war,” he said. He analogized the current state of affairs to what it would be like if the U.S. men’s national soccer team showed up to the World Cup while adversaries went to an entirely different country and stadium. While the U.S. is waiting for the games to start, competitors announce they’ve won the championship. Townsend also drew parallels to the Cold War in which the two main competitors, the U.S. and the Soviet Union, were locked in competition but showed restraint in never engaging in armed conflict throughout the 44-year salvo. Townsend explained during his presentation, as he had in past appearances, that while the Army is leading the way — even having published the first draft of its doctrine titled multidomain battle version 1.0 — there needs to be joint and multinational buy-in for this to be successful. “Right now there are only Army signatures on multidomain concept documents. We want to get other services’ leaders to sign on. We will get there I think but we’ve got to do some work there,” he said during a March 8 speaking engagement. He articulated that the Army’s goal is to release multidomain operations 1.5 in the fall. This will be “an evolution of our concept, largely will be U.S. Army document but we want it to be joint service and multinational partner capable, that document,” he said, adding there is currently great collaboration within the DoD. This collaboration was exemplified during an April symposium hosted by the Army and Marine Corps on the future of multidomain operations. C4ISRNET attended the symposium, which was conducted under Chatham House rules. 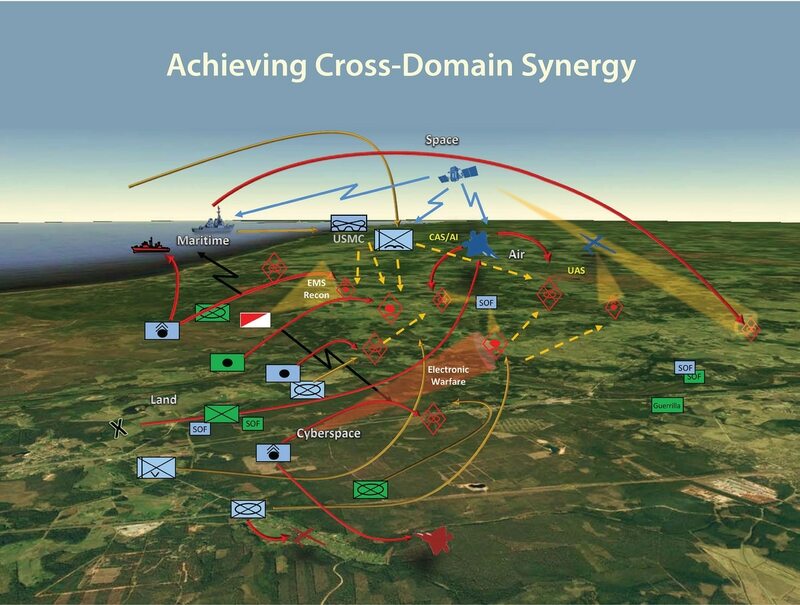 Officials during the symposium — which included senior leaders and members of the joint services, academia and multinational partners — stressed that any future joint multidomain plan will be focused at the operational level with strategic and tactical underpinnings saying it’s going to be joint and multinational. Leaders also noted during the event that the eventual plan will be focused on 2030, which participants pointed out is just outside of what is known as the future years defense program.